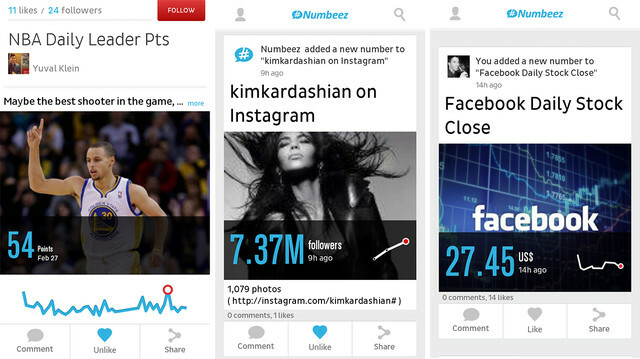 Instead of tracking headlines, Numbeez tracks numbers. Here’s why that might not be as absurd as it sounds. When Mark Zuckerberg says he wants to build a “personalized newspaper,” he’s talking about photos, conversations between friends, music, and news articles. But when a small startup in Tel Aviv called Numbeez says its developed an app for personalized updates, it only has one component in mind: Data. No written analysis. No witty comments. No links to news stories. Just numbers. The app is a dashboard for tracking numbers you care about–sports scores, stock prices, how many Twitter followers you have, the price of the airline ticket, whatever–and it leaves out everything else. For example, explains Numbeez VP of Business Development Shira Sarid, “Today in Tel Aviv, it’s probably about 95 degrees. Just by saying it’s 95 degrees outside I’m saying I’m miserable. I don’t have to say anything else.” It works the same way with a sports stat. You scored 29 points? We know you had a good game. Maybe we’ll eventually want to talk about why that was, but the score is enough to get the idea across. Users add new, automatically updating stats to their dashboards using a Numbeez bookmarklet (like a Pinterest “Pin It” button) or, if there’s no public data feed available, by manually entering a number, such as the distance of their daily runs, from the app. Anyone can add a public number another user has posted to their own dashboard, which doubles as a profile, or comment on a public “story.” Numbeez currently has no business model, but Aharonson suggests it could collect affiliate sales fees for products purchased after users track their prices. Is an app for tracking a grab bag of numbers something anyone has ever asked for? No. But the same things that make the idea sound absurd make it a plausible success. There are already apps for tracking prices, sports, fitness, finance, the weather, calories, books, and just about everything else, which suggests a desire to track personal and public data that Numbeez has condensed into one interface. Meanwhile, as sharing online has become more prevalent, what we share online has necessarily been whittled down–from blog posts to status updates to photos. Sharing numbers is just another step in the same direction. A social app that revolves around something as impersonal as raw numbers may sound a little ridiculous, but in a way, it makes more sense than wading through a cluttered Facebook feed or an app that promises to learn your reading habits.